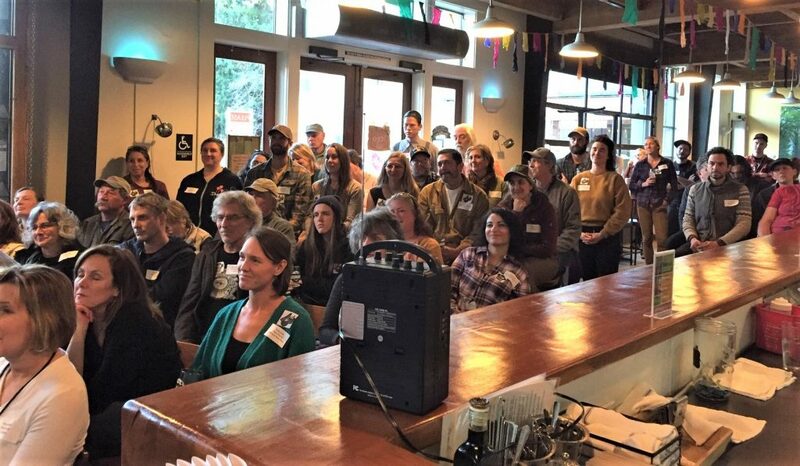 Hosted by Sierra Harvest, BriarPatch Food Co-op, and Three Forks Bakery and Brewing Co, the workshop ‘Putting Local on the Menu’ brought together nearly 70 food service professionals and food producers from throughout Nevada County to talk about building a stronger local food economy. Area chefs know how challenging it can be to feature local food on their menus and the event was designed to learn how farm direct purchasing can differentiate a business, enhance the local economy and improve marketability. Presenters included Nevada County Food Policy Council coordinator Stephanie Stevens, owner and head chef of Three Forks Bakery and Brewing Co. Shana Maziarz and Sean Dockery, farmers Kristen Draz and Wil Holland of FogDog farm, ranchers Ciara and Michael Shapiro of AM Ranch, BriarPatch Food Coop produce manager David Benson, and Sierra Harvest procurement specialist Lauren Scott. Over a dozen local farms participated in the conversation and Tim VanWagner of First Rain Farm shared, “There’s a lot of good energy around these issues right now. The time is ripe to figure out ways to make and sustain the needed connections between producers, restaurants and caterers; it’s just a matter of identifying the best methods to do so”. “People are interested in learning more and figuring out how to do this” said Nevada County Grown’s new Executive Director, Shanin Ybarrondo. What she valued most about the event was that the conversation has started and it emphasizes the importance of the relationships. 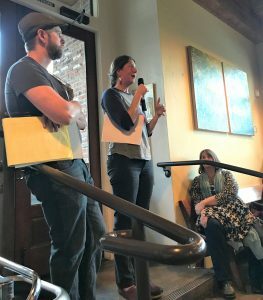 Nevada County Grown is poised to support this effort by meeting with individual producers and buyers to understand their needs around promoting their efforts to put local on the menu. Producers and buyers had the opportunity to address the barriers of getting local food onto menus and into the hands of residents and visitors alike. Participants shared their challenges as well as their ideas for overcoming those obstacles. Organizers see this event as the first in a series to build a collaborative effort to increase the number of Nevada County eateries serving local produce. If you would like more information about how to get involved or to support this effort, please contact Lauren Scott, procurement specialist at Lauren@sierraharvest.org or call 530-265-2343.